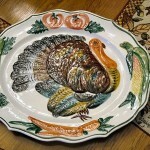 Several years ago while looking around one of the many closets in my parents’ house that was stuffed with artifacts, I came across a giant platter with an image of a turkey on it. I pulled it out, showed it to my mother, and asked her why we were not using it every Thanksgiving. My mother saw that platter and was instantly sentimental. “Where did you find that?” I told her. “That was one of the few things I have from my mother’s family. My mother went on to tell me a story about her mother and her aunt, her mom’s sister. Apparently they were very close, but had a volatile relationship. My grandmother would get mad at her sister and then break anything she could find that was related to her. The platter was handed down from at least two prior generations, and oddly, came from Italy . Anyway, somehow it made it to my grandmother via her sister and was spared the fate of so many other would-be family heirlooms. In modern times, the platter has been reintroduced to our family and comes out every year for thanksgiving. For most of the past several years, that dinner was held at my parent’s rural New Hampshire country home. That was up until last year when we moved my parents to a more convenient adult community. Thus the family heirloom turkey platter passes to a new generation. 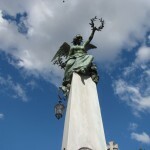 We are back in Argentina for a little vacation in November for the second straight year and we continue to be surprised by this hectic and quirky city. One new place we discovered on this trip is a book store. Book stores may not be a destination for many while on vacation, as they are not normally tourist destinations. But we read about a book store in the Recoleta neighborhood that we just had to check out — El Ateneo Grand Splendid. Located on Santa Fe, one of the city’s main shopping streets, El Ateneo Grand Splendid is the flagship store of the El Ateneo chain – think the Barnes & Noble of Argentina. This bookstore is amazing. It is pretty much like any other large bookstore as far as inventory – but this place is special as it is located inside a glorious old theater. Picture a theater with the seats removed and a bookstore put in. The place is absolutely wonderful. Pictures do not do it justice. 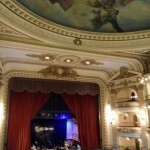 Basically the interior is as it was when it was a theater – complete with a café behind the curtains where the stage once was. We browsed around for a while – and bought a couple of books. But we were truly impressed with an amazing setting for a bookstore. Places like El Ateneo Grand Splendid make you feel good – in a time when websites and e-readers threaten libraries and printed text – that there are still places that celebrate books in a grand fashion. I will admit that when I wrote about Tuthilltown Spirits’ Hudson Four Grain bourbon recently, the thought crossed my mind that I thought that bourbon could only be made in Kentucky. After all, all the bourbons I ever had had come from there. “Bourbon whisky”, “rye whisky”, “wheat whisky”, “malt whisky”, or “rye malt whisky” is whisky produced at not exceeding 160 proof from a fermented mash of not less than 51 percent corn, rye, wheat, malted barley, or malted rye grain, respectively, and stored at not more than 125 proof in charred new oak containers; and also includes mixtures of such whiskies of the same type. It has nothing to do with location, as like Champagne for example. So I guess we are all free to make bourbon wherever we are. After the Tuthilltown posting, I was turned on to another New York State maker bourbon – this one in New York City no less: Kings County Distillery. Kings County Distillery calls themselves, quite cheekily, “New York City’s oldest operating whiskey distillery” as it has only been licensed since April 14, 2010. 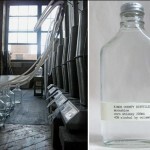 Kings County Distillery is the first licensed maker of whiskey, bourbon, and moonshine in New York City proper since prohibition. Very cool. I will be tracking down some of this Kings County bourbon, but it may be a while since they are so new. It seems the moonshine is the first product to market. These are the coolest postcards I have seen in some time: The Make Cities Postcards and Papercraft. 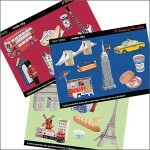 These cut-out and fold cards feature icons of London , Paris and New York , respectively and are quite unique. 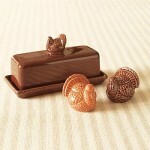 I would love to be sent one of these or send them myself to friends and family who I know would love them. Sophie first saw these in a shop in Sydney and did not purchase them. She found them on the shop’s website but they did not ship internationally. But thanks to the good folks at Yahoo search we found them for sale in the US! 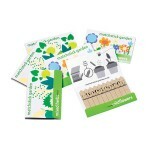 These cool postcards are available from a few retailers, but we found a complete set at Architect Gifts Plus – where you can find other fun stuff as well. My favorite is the Empire State Building cut-out, complete with King Kong and a miniature Faye Wray. Very cool! I drink a ton of soda. Too much some say. But I love the stuff. Although I drink mostly Diet Coke or Diet Pepsi (I am not brand loyal) I also love a good seltzer. Every time I go to the supermarket my cart fills up quickly with the various beverages. I usually have four or five twelve packs of cans, another five or six two liter bottles of diet cola, and a bunch of one liter seltzers. More often than not the cashier will say something like: “thirsty?” – to which I pretend it is the first time I ever heard it. Then of course I drink the stuff which results in a bunch of empties – which in Massachusetts (where I live) are returnable for a 5 cent deposit. Even with the volume of my empties, I can’t be bothered to return the bottles, so at home I save them up until I have a big bag full which I put out for the recycle truck – but more often than not get taken away by someone who is willing to do the leg work. I am fine with that. At the office, I put my returnables in a donation box which goes to help some local charity. Well, I think I have finally found the alternative – make my own soda and seltzers at home. 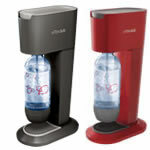 To accomplish this, I have recently ordered a home soda maker from Soda Stream. Of course seltzer bottles have been around forever and this is just a twist on that – but I love how they make it so easy and offer a few different cool styles of the product. I will provide a complete report. This could be the next slow cooker or bread machine!